The last four signs of the zodiac -Sagittarius, Capricorn, Aquarius, and Pisces, are known as the collective or universal signs in astrology, and not only describe our collective psychology, but also the true nature or construction of our universe or cosmos. Pisces, the 12th or last water sign(ruled by Neptune) describes the vast oceanic universe we all live in. It is becoming increasingly evident that what we know or have been taught as outer space is not a vacuum but actually consists of water or a water-like substance. Both the bible and the Vedas say we are a world or universe surrounded by water. 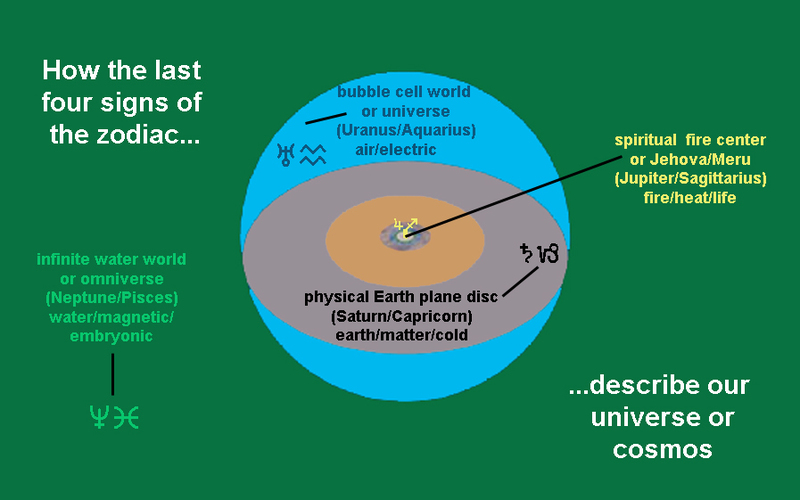 Aquarius, the 11th or last air sign(ruled by Uranus) describes the air bubble world or universe we live in. When the firmaments or waters were divided, a spherical air bubble came into being which held the waters out. Our breathable atmosphere is part of this air bubble. Capricorn, the 10th or last earth sign(ruled by Saturn) is the flat earth solid material plane we live on/in. It divides the air bubble into an upper half(Heaven) and lower half(Hell). The earth or material plane is the densest and most defined but also the hardest or most difficult plane to live on. Sagittarius, the 9th or last fire sign(ruled by Jupiter) is Zeus/Jehovah or God or the ruling axis center(Mount Meru/Mount Olympus?) of the flat Earth plane. Around Zeus or the "king of the Gods" revolves the lesser God of the Sun/Apollo(12 times less the orbit of Jupiter), and orbiting the Sun are the satelite planets of Mercury and Venus(never more than 48 degrees away from the Sun).